Airbus has developed a five-blade version of the H145 helicopter that provides a significant increase in lift while simplifying the main rotor system. DONAUWORTH, Germany — Airbus has developed a five-blade version of the H145 helicopter that provides a significant increase in lift while simplifying the main rotor system. It weighs in at less than the existing four-blade version of the popular twin-engine aircraft. Development of the five-blade rotor system has been in the works for years, but the company is nearing the end of flight testing and is preparing to offer it both as a retrofit to Fenestron-equipped H145D2 aircraft and as a feature of new-build H145s beginning in 2020, according to Axel Humpert, Airbus senior vice president and head of H145 programs. It produces about the same noise as the current H145 and the same fuel efficiency. Maximum takeoff weight goes from 3.7 tons to 3.8 tons with no loss in performance and a slight reduction in weight. Besides delivering on the market’s desire for more useful load, the new rotor system simplifies the existing machinery by eliminating several components including the titanium rotor head and the oil and grease it requires. The entire retrofit assembly is made of composite materials, eliminating metal and saving weight while increasing performance, Humpert said. Instead of attaching to a rotorhead, the new blades attach directly to the rotor mast. Each blade consists of a high-tech “cuff” with a flex beam inside that takes place of all bearings and the rotor head. The blade attaches to the cuff with two large bolts, one of which can be removed to fold the five blades rearward, which reduces the space required to store the aircraft. The dimensions of the aircraft are basically unchanged, except the rotor is 10 cm higher than the H145D2, but the aircraft is 10 cm shorter overall, from the tip of the blade to the rear of the Fenestron shroud. The new rotor has a diameter of 10.8m, down from 11m for the previous blade. By carefully engineering the new blade and rotor cuff, the five blades produce more thrust than four without any increase in aerodynamic drag, Humpert said. The cuff is attached with two bolts to the main rotor shaft. The flex beam inside the cuff takes all the momentum forces to change pitch. A five-blade configuration required retuning the front skid cross tube and rear stabilizer and allowed the elimination of dampers on either side of the skids. The new configuration also requires none of the anti-vibration systems under the seats. A pleasant side effect of the increased blade surface area is an exceptionally smooth ride. The aircraft still has significant power margin and includes a “train” mode that digitally simulates the loss of one engine through the avionics readouts while retaining the use of that engine in an emergency. Even on one engine, the aircraft can climb precipitously, which is ideal for EMS and other missions in confined environments. Even with the addition of an electro-hydraulic actuator to assist pilots in pre-flight rotor pitch checks, the entire operations of replacing the four-blade rotor system with the new configuration cut 50 kg from the overall empty weight of the aircraft, Humpert said. The retrofit can be done at any level-D modification repair and overhaul (MRO) shop. There is no life limit to the rotor system, but it is inspected on condition, Humpert said. A new wireless aircraft connectivity system (WACS) transmits cellularly or over wifi health, usage and flight monitoring data. That is done now with a physical USB stick. Airbus has delivered 1,513 H145s to 270 operators, so the existing market for retrofits of the five-blade system is ready and substantial, Humpert said. Eventually, the five-blade rotor system will completely supplant the four-blade configuration, but for now customers can decide which they want. An order of 43 H145s Airbus currently holds could go either way. 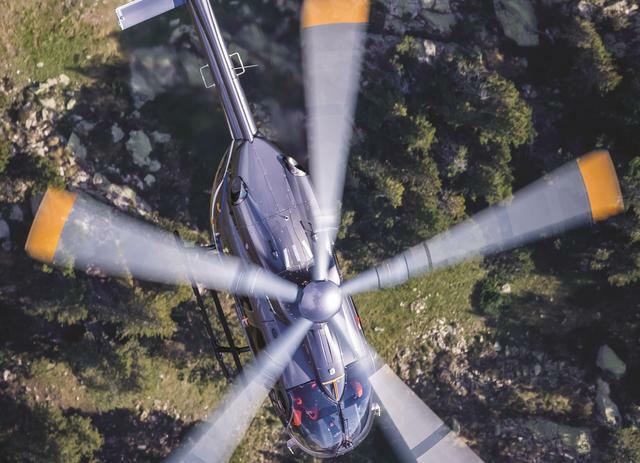 Humpert said there are some customers that will want the H145D2 to keep their existing fleets common, but the market will eventually gravitate to the more powerful, lighter H145D3. A military version of the retrofit should gain certification a year after the commercial version, Humpert said. “When you look to the military market, it’s the affordable choice, compared to the expensive Apache or Tigers,” he said.